Months after televangelist Kenneth Copeland acquired a new multimillion dollar Gulfstream V jet for "the Lord's work," another prosperity gospel preacher, Jesse Duplantis, is asking his followers to help him buy a $54-million brand new Falcon 7X jet that he says he is "believing God for." 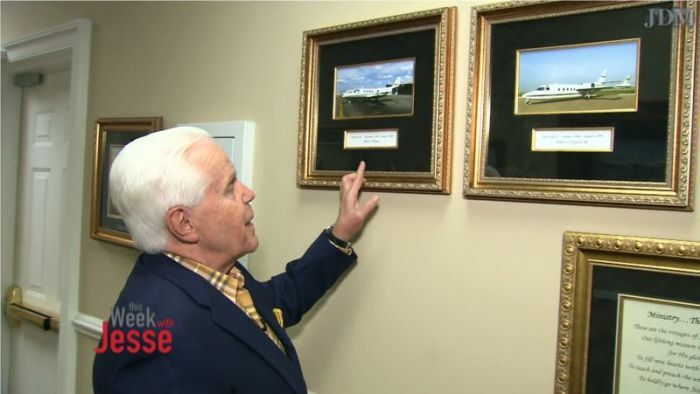 "You know I've owned three different jets in my life and used them and used them and just burning them up for the Lord," the Louisiana-based televangelist says in a video, appealing for funds, on "This Week with Jesse." "Now some people believe that preachers shouldn't have jets. I really believe that preachers ought to go on every available voice, every available outlet, to get this gospel preached to the world," he adds. In the video, Duplantis goes on to point to pictures of jets hung on the wall that he has owned over the years, and then shows the Starship Enterprise. "This is where I'm going, praise God—what I'm believing God for," he says. Duplantis says he wants this new jet so that he can go to places non-stop, which he cannot do with the plane he currently owns. He adds that God has asked him to believe Him for a Falcon 7X, and not to pay for it. "Jesse, I didn't ask you to pay for it. I asked you to believe for it," he claims God told him. "I really believe that if Jesus was physically on the earth today he wouldn't be riding a donkey. Think about that for a minute. He'd be in an airplane preaching the gospel all over the world," he adds. Texas-based televangelist Copeland of Kenneth Copeland Ministries in January announced the acquisition of a "debt free" jet, which hit the market with a $36 million price tag in 1998. To thank donors for it, Copeland prayed thus at the time: "Father we thank you so and I'm asking you now sir, according to your word, bless our partners beyond measure. Yes, in the name of Jesus. For you said in 2002, 'I'm sending you new partners who are very strong financially and they will obey me. And I will increase your longtime partners and they will obey me. And you will not come short. And you will not fail. And you will not lack. And you will not come behind and you will not be diminished. Praise God." In early 2015, prosperity gospel televangelist Creflo Dollar saw intense public criticism after he similarly asked his donors to contribute for a new $65 million jet. The board of World Changers Church International, founded by Dollar, said at the time: "It is our belief that this ministry is called to serve people globally — to literally change the world according to the Great Commission — and our infrastructure and operational plan reflect the worldwide nature of that assignment. Our pastors share the gospel of Jesus more than 300 times per year — in churches, arenas, venues, convention centers, stadiums and other facilities across the entire planet — and are committed to aggressive travel schedules that cannot be fulfilled via any means other than private aircraft." Dollar eventually shut down the new jet campaign but remained defiant to his critics. Then in June 2015, the ministry bought the jet anyway, claiming it was necessary for ministry.